A crane machine, generally equipped with a hoist rope, wire ropes or chains, and sheaves, that can be used both to lift and lower materials and to move them horizontally. It is mainly used for lifting heavy things and transporting them to other places. The device uses one or more simple machines to create mechanical advantage and thus move loads beyond the normal capability of a human. Cranes are commonly employed in the transport industry for the loading and unloading of freight, in the construction industry for the movement of materials, and in the manufacturing industry for the assembling of heavy equipment. The first known construction cranes were invented by the Ancient Greeks and were powered by men or beasts of burden, such as donkeys. These cranes were used for the construction of tall buildings. 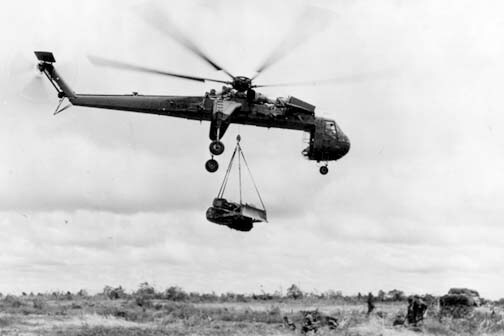 Larger cranes were later developed, employing the use of human treadwheels, permitting the lifting of heavier weights. In the High Middle Ages, harbour cranes were introduced to load and unload ships and assist with their construction – some were built into stone towers for extra strength and stability. The earliest cranes were constructed from wood, but cast iron, iron and steel took over with the coming of the Industrial Revolution. For many centuries, power was supplied by the physical exertion of men or animals, although hoists in watermills and windmills could be driven by the harnessed natural power. The first 'mechanical' power was provided by steam engines, the earliest steam crane being introduced in the 18th or 19th century, with many remaining in use well into the late 20th century. Modern cranes usually use internal combustion engines or electric motors and hydraulic systems to provide a much greater lifting capability than was previously possible, although manual cranes are still utilized where the provision of power would be uneconomic. 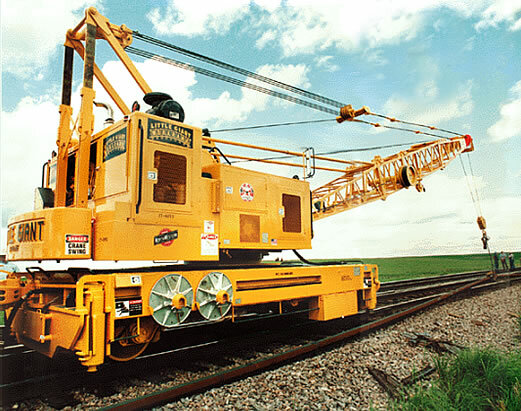 Cranes exist in an enormous variety of forms – each tailored to a specific use. Sizes range from the smallest jib cranes, used inside workshops, to the tallest tower cranes, used for constructing high buildings. Mini-cranes are also used for constructing high buildings, in order to facilitate constructions by reaching tight spaces. Finally, we can find larger floating cranes, generally used to build oil rigs and salvage sunken ships. Medieval (15th century) port crane for mounting masts and lifting cargo in Gdańsk, modern-day Poland (historically also a German city called Danzig). Tower crane at the inland harbour of Trier from 1413. An 1856 photo of Cologne Cathedral, then unfinished, with a 15th-century crane on south tower. Sir William Armstrong, inventor of the hydraulic crane. Broken crane in Sermetal Shipyard, former Ishikawajima do Brasil - Rio de Janeiro. The cause of the accident was a lack of maintenance and misuse of the equipment. Cranes can mount many different utensils depending on load (left). 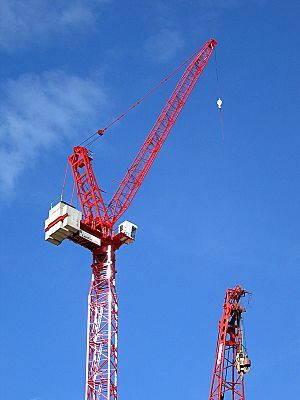 Cranes can be remote-controlled from the ground, allowing much more precise control, but without the view that a position atop the crane provides (right). The stability of a mobile construction crane can be jeopardized when outriggers sink into soft soil, which can result in the crane tipping over. This crane's main jib failed due to an overload. A self-erecting tower crane folds itself up at Erlangen, Germany. Crane (machine) Facts for Kids. Kiddle Encyclopedia.